Russian President Vladimir Putin says Russia will not sit idle while others increased their military capabilities along its borders in the Far East. 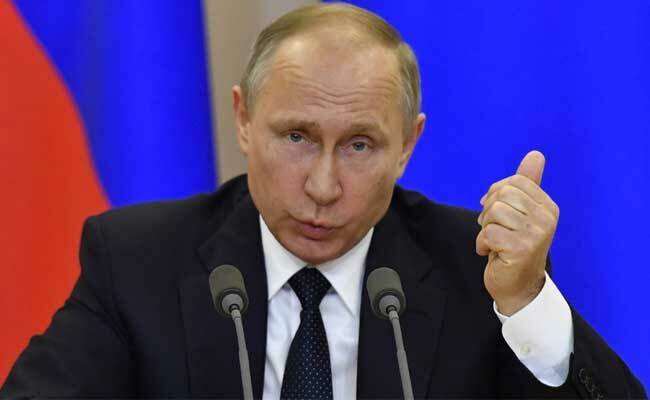 Saint Petersburg: Russian President Vladimir Putin said on Thursday that elements of a U.S. anti-missile system in Alaska and South Korea were a challenge to Russia and that Moscow had no choice but to build up its own forces in response. Putin, speaking at an economic forum in St Petersburg, said Russia could not stand idly by and watch while others increased their military capabilities along its borders in the Far East in the same way as he said had been done in Europe. He said Moscow was particularly alarmed by the deployment of the U.S. THAAD anti-missile system to South Korea to counter a North Korean missile threat and to reported U.S. plans to beef up Fort Greely in Alaska, a launch site for anti-ballistic missiles. "This destroys the strategic balance in the world," Putin told a meeting with international media, the start of which was broadcast on state TV. "What is happening is a very serious and alarming process. In Alaska, and now in South Korea, elements of the anti-missile defence system are emerging. Should we just stand idly by and watch this? Of course not. We are thinking about how to respond to these challenges. This is a challenge for us." Washington was using North Korea as a pretext to expand its military infrastructure in Asia in the same way it had used Iran as a pretext to develop a missile shield in Europe, charged Putin. Putin said the Kurile Islands, a chain of islands in the Far East where Moscow and Tokyo have rival territorial claims, were "quite a convenient place" to deploy Russian military hardware to respond to such threats. Defence Minister Sergei Shoigu said last year Russia planned to deploy some of its newest missile defence systems and drones to the islands, part of a drive to rearm military units already stationed there. He has also spoken of Russia building a military base there. "I don't agree that we are unilaterally starting to militarise these islands," said Putin. "It is simply a forced response to what is happening in the region." Any talk of demilitarising the islands could only occur once tensions in the entire region had been reduced, he said. Tokyo and Moscow have long been locked in talks over the contested islands, known as the Northern Territories in Japan. Putin said Russia was alive to the danger that Japan might allow U.S. troops to deploy there if it struck a deal to hand over some of the islands to Tokyo's jurisdiction. "Such a possibility exists," said Putin. Russia did not want to worsen already poor relations with Washington by fuelling what he described as an arms race, but Putin said the United States was still consumed by what he called an anti-Russian campaign. "How will the situation develop? We don't know," said Putin.